Dr. Jenny Mejia is a chiropractic physician that practices in Tampa, FL. Dr. Mejia was honored on January 9, 2014 at Parker Seminars in Las Vegas, Nevada at the Rio All-Suite Las Vegas Hotel and Casino with the prestigious award of 2014 Chiropractic of the Year. Written on the award it states “For outstanding contribution and dedicated service to the chiropractic profession, your patients, your community, and this organization.” Each year at Parker Seminars Las Vegas, Parker Seminars has the pleasure of honoring Doctors of Chiropractic who consistently exceed the already high standards the chiropractic profession embodies. 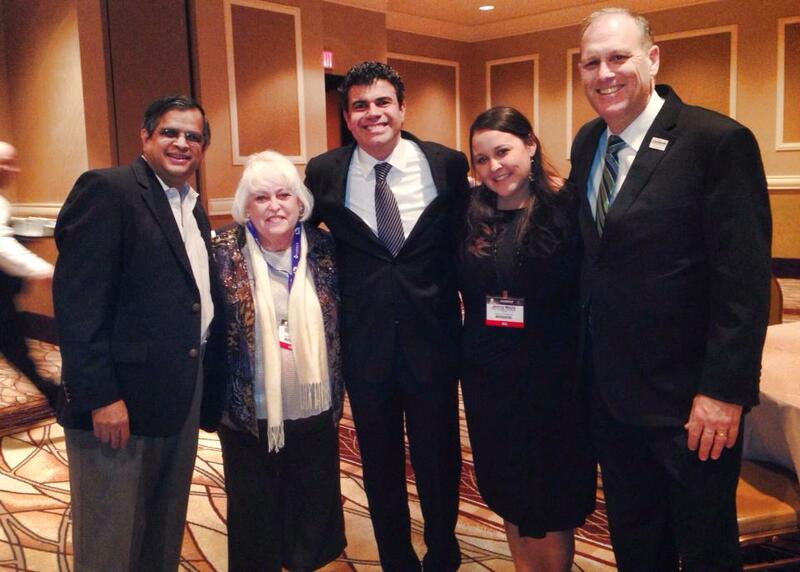 Taken at Parker Seminars 2014 seminar in Las Vegas from left to right: Dr. Narain Naidu (medical microbiologist & immunologist), Dr. Glenda Foy (Mother of Dr. Jenny Mejia, Palmer College of Chiropractic Graduate), Dr. Fabrizio Mancini (President Emeritus of Parker University), Dr. Jenny Mejia (2014 Chiropractor of the year) and Dr. Brian McAulay (president of Parker College of Chiropractic). Jenny Mejia, DC was born in Illinois, a third generation woman chiropractor graduating from Palmer College of Chiropractic. She grew up in a home where both her parents were Chiropractors, she learned at an early age the fundamentals of being under proper Chiropractic care. After earning her undergraduate at Augustana College in Rock Island, IL; she continued her passion for health and wellness by earning her doctorate degree at Palmer College of Chiropractic. Dr. Mejia, Chiropractic Physician is dedicated to educating and helping as many patients as possible. Her goal is to educated her patients, and help them understand the cause of their problems. Dr. Mejia, Chiropractic Physician constantly strives to update her knowledge through additional training in rehabilitation of injuries especially after an auto accident, headaches, TMJ, neck pain and back pain by attending continuing education courses and seminars. Her goal is to educate patients and provide them with the tools for life-long health. Dr. Mejia practices a variety of techniques including Thompson, Diversified, Activator Methods, Gonstead and Palmer Package. Jenny Mejia DC is a board member of the World Congress of Women Chiropractors (WCWC). She also is on the leadership team for Business Builders the Westchase, FL Chapter of Business Networking International (BNI). Dr. Mejia is an active member of the Westchase Area Business Association (WABA), League of Chiropractic Woman, Upper Tampa Bay Chamber of Commerce, Hillsborough County Chiropractic Society (HCCS), Florida Chiropractic Association (FCA), Professional Philanthropy Network (PPN) of Tampa Bay, and Woman in Networking (WIN) of Tampa Bay. Dr. Jenny Mejia, DC office is located at 11232 W. Hillsborough Ave Tampa, FL. If you'd like more information about this topic, or to schedule an interview with Dr. Jenny Mejia please call 813-925-9700.